Ulrichsweb™ helps librarians and patrons avoid the frustration and time-consuming process of gathering serials information in bits and pieces from multiple sources. Only Ulrichsweb brings together the latest bibliographic and provider details you need in one location, with user-friendly searching of comprehensive information, integration with your discovery services and OPAC, and interoperability with other elements of your serials workflows. Users obtain the most comprehensive scope of serials coverage through Ulrichsweb. They can find details about titles from scholarly, Open Access, business and niche publishers across all subject areas and languages – plus databases and A&I sources. Find comprehensive bibliographic and provider information through a single interface that provides users with advanced search, quick search, and language localization. Users discover all of the details about a serial in one place with tools for information sharing. Feel at ease and know that the serials data you use is the most current information available. Data is updated weekly, with regularly scheduled publisher and provider outreach and independent research. Personalized alerts notify you of new, changed, and ceased titles. increasing efficiency for librarians. Provide faculty with information on serials in their disciplines, use at the reference desk, locate A&I coverage, verify details, use as a source of price data, and more. Make it easy for users to move between your serials resources by providing options for linking into and out of Ulrichsweb. By doing so, you are providing users with more flexibility to find the information they desire, and leveraging your other serials resources. Stay on top of developments in the serials industry by gaining access to all reviews from the latest edition of Magazines for Libraries™, integrated and displayed in Ulrichsweb records. Each review is written by a professional librarian and subject specialist. 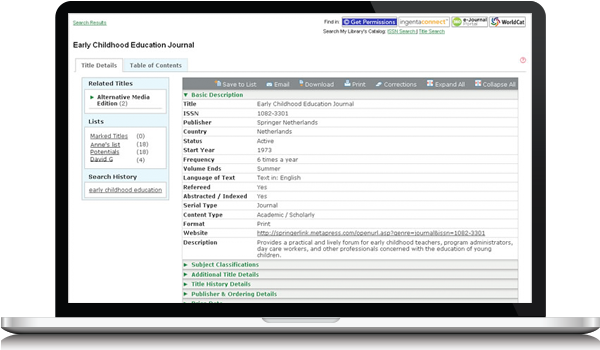 Incorporate authoritative serials data into the library’s journal awareness services, course lists, link resolver results, and other library web pages. Ulrichsweb delivers the highest level of serials coverage, across 383,000 serials, 977 subject areas and 200 languages. Data is updated weekly, and records include searchable TOCs, ISSN, title, publisher, online availability, subject area, language, list prices and more. A search result provides a complete picture of a periodical. It includes easy-to-navigate tabs – basic and full descriptions, online and A&I availability, publisher and ordering contacts, and more – while also providing linking options, bibliographic data, and personalization tools. Multiple linking options connect users from search results to your library’s OPAC, OpenURL link resolver, and subscription services such as JCR® Web, ScienceDirect, and the CCC’s Permissions Direct. 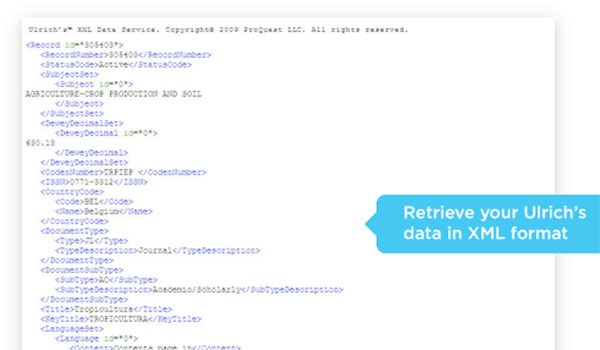 Linking to and from your 360 Core A-to-Z title list is also available. 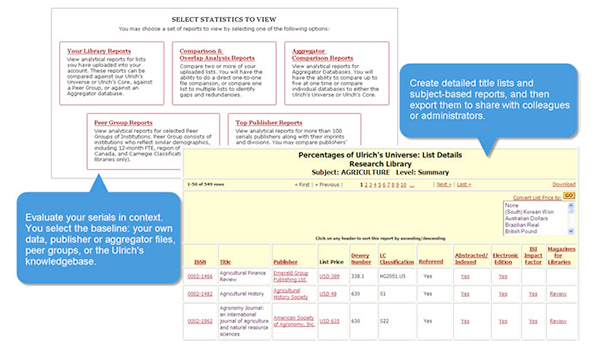 Integrate Ulrich’s data into your library’s web pages and discovery services to provide researchers and staff with reliable, continuously updated details about electronic and print serials and their providers. Save time and make informed decisions about which print and electronic serials best meet the needs of your patrons, researchers, and faculty with the robust analysis and reporting capabilities of Ulrich’s Serials Analysis System.